What had occurred to pull our respectable shipwright out of his bed to lead to party of armed men to search the Kentish coast and shipping? The story is actually one which has all the hallmarks of a rather overblown romantic fiction, with cross dressing, escapes from the Tower, forbidden love and tragic death, only redeemed because it happened to be true and one, to my embarrassment, which I had not come across before. “Lady Arabella” was Arbella Stuart, granddaughter to both Bess of Hardwick and Margeret Lennox, Niece of Mary Queen of Scots, thus descended from Henry VIII’s sister. As it became clear that Queen Elizabeth, last surviving of her father’s brood would die childless, England had to look back a generation for the succession which yielded both Arbella and James Stuart of Scotland. It is arguable whether Arbella really had any chance of taking the throne if James survived Elizabeth, but she was certainly the next strongest claimant and Elizabeth used the threat of her inheriting to keep James honest and used the prize of marrying her pedigree as a bargaining piece in her diplomacy. 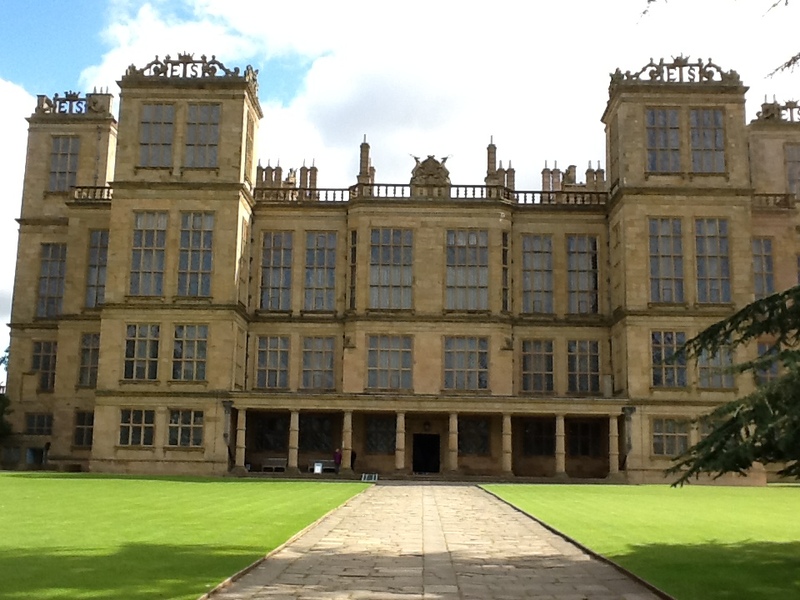 Although Arbella spent some time at court, she spent most of her childhood and young womanhood under the strict controlling care of her formidable Grandmother, Bess at Hardwick Hall in Derbyshire. With Elizabeth close to death, Arbella made an extraordinary move, seemingly entirely of her own volition, and tried to arrange a marriage, without the Queen’s consent to Edward Seymour, one of the leading nobles in England and with an outside claim to the throne himself. Her plot was discovered and she found herself in considerable royal disgrace, at least until Elizabeth’s demise. Even before this incident she felt that she was a virtual prisoner at Hardwick which was proved to be so when, after the Seymour debacle, she tried to leave, with an elaborate escape planned with a group of gallants, only to be stopped at the gate of the hall. James, once securely on the English throne was somewhat kinder to her and she seemingly repaid him with loyalty, rejecting the “Main Plot” to kill James and put her on the throne. Then in 1610 in another misguided act of impressive boldness she married, in secret, Edward Seymour’s younger brother William, a man twelve years younger than the now 35-year-old Arbella. It is unclear if this was a true love match, but even if Arbella herself had given up any pretensions to the throne, any offspring would be potential claimants should circumstances change. This marriage was illegal without the King’s permission and both were arrested, he imprisoned in the Tower and Arbella, after a while held in London, was due to be sent north to imprisonment in the care of the Bishop of Durham. She rode to the Thames and after delaying (fatally as it turned out) waiting for William who had missed their rendez vous was rowed out to sea by some watermen (who promptly doubled their fee during the short trip). Avoiding the attentions of our Phineas Pett and others she boarded a pre-arranged French barque under a Captain Corvé and, delaying again for William, set sail for France. The delays however had been crucial and with English shipping alerted for the fugitive, the Pinnace “Adventure” caught up to Corvé’s ship, fired “Thirteen Shots Straight into the vessel” (More again) which promptly struck their colours and Arbella and her party were captured. She was imprisoned in the Tower where, after a few vain attempts to escape, she died, miserable and dispirited in 1615. William Seymour on the other hand, having successfully escaped to Ostend, was virtually forgotten about by the government, being no threat after the capture of Arbella. The degree of forgiveness often shown in the Seventeenth Century, (as well as its equally frequent absence) often astonishes me and William was back soon after Arbella’s death, an MP by 1620 and was a prominent Royalist during the Civil Wars and survived to see his loyalty pay off in the restoration. It is a remarkable story and one I’ve only sketched here in the barest detail but one I’m surprised isn’t better known, although I realise I may be projecting my ignorance on the wider public. With the romance and adventure of the tale I would have thought that she would have been the darling of the the more romantic historical authors, whereas I believe only Doris Leslie in the 40’s has made her into such a heroine and I know of no stage or screen adaptation of her life. 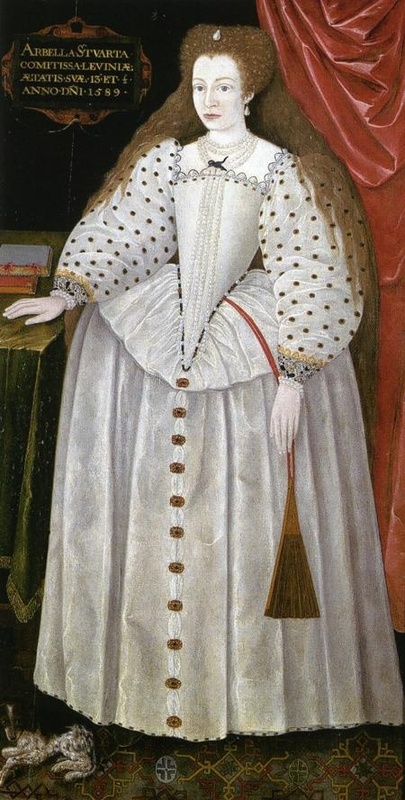 Even at Harwick Hall where she spent much of her life, although not ignored, she is painted as an incidental figure, a sidebar to Bess of Hardwick. Perhaps the reason for her relative obscurity now is that her significance during her lifetime was always what she could possibly be, not who she actually was or what she did. She was never expected to take the throne. Her position as a rival claimant was vital, but entirely passive. Her existence and lineage put her in the position of rival (or, perhaps more properly, alternative) heir to the throne but nothing she could do make this work to her advantage. In fact it was in almost everyone’s interest, certainly of the two monarchs that she did absolutely nothing. She was dangled, on occasion, as a potential bride to both domestic and foreign suitors, and as James’ daughter, Elizabeth showed a generation later, this could lead to an influential and significant existence in a foreign court, but even this was denied to her. Her name was worth using at bait, but for her to marry and possibly bear children was not a risk worth taking. The tragedy of her existence (and it seems to have been a life with very few moments of happiness) was, to me, that she understood all this. She was an educated and fairly intelligent (if deeply unwise) woman. She understood that whilst her existence and ancestry was useful, her person was a an inconvenience. She fought against this her whole life. The proposed and actual marriages to the Seymours, the dramatic attempted flights were, more than simple escapes from the gilded cage she found herself in but, far more attempt to forge an existence for herself beyond her pedigree, a plea for the world to recognise her. That maybe makes it all the crueller how largely forgotten she is. She does at times come across as a hard woman to like, and her judgement was disastrously poor but I can’t help feeling great pity for her. There were few other women who appeared in the account of Phineas’ Pett’s life although one of them, yet another Elizabeth, this time the widow of his half-brother, Peter contrasts with the somewhat passive roles Phineas ascribes to the women around him by taking an aggressively active role. Phineas owed Peter £325 as a consequence of badly conceived venture in the early 1620s. 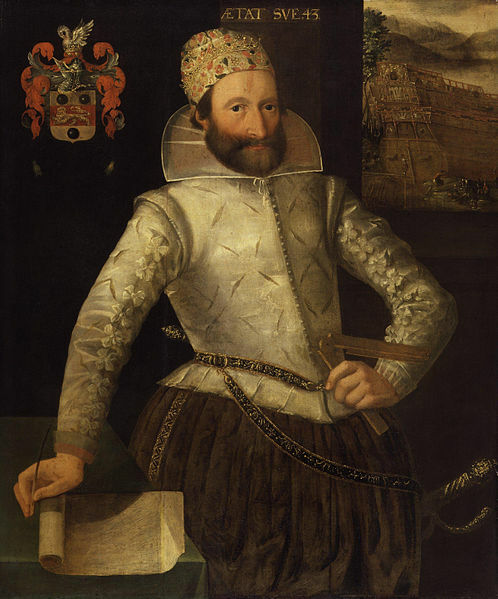 Phineas had a complex personal and professional relationship with his brothers and it was not repaid during Peter’s life, but after his death in about 1631, Elizabeth, seemingly pursued by creditors herself went after Phineas with a vengeance. She had him arrested by bailiffs and despite using all his wiles, pleading his status as a King’s servant and his own alleged poverty it seems she final got her case heard at law and received payment. Getting money out of Phineas was no mean feat and Elizabeth must have been a persistent women. So what has this brief survey of three generations of Pett women told us about the lives of Early Modern women and their families? Well, maybe nothing a student of the era didn’t know already to be honest, but although the sample is too small to be anything but anecdotal there are some interesting examples and reinforcements of what we already know. Age at first marriage remains quite elusive for the women (or, indeed men) in question, but I’ve had a stab at estimating ages from what dates we have. In the case of Ann and Phineas’s mother, Elizabeth, they were married young enough to allow for twenty-plus years of childbearing so we can assume their late teens or early twenties. I have reckoned that the unfortunate Rachel was in her late teens when she married (and so not much older when she died). These are somewhat (although not much) younger ages than the mid-twenties which is considered the norm for Early Modern North-west Europe, perhaps due to the comparative affluence of the families involved. Pett births were usually spaced at about two years- about the norm for non-wetnursed children. Although we don’t know exact ages, the long periods between first and last recorded live births makes it clear that Early Modern women could, and did, safely give birth into their forties. This, of course, is not news and we only have to look at how late people gave up on the chances of an heir from Queens Elizabeth and (especially) Mary so see what contemporary expectations for the age at which even first pregnancies could be expected. It does, though contradict the misguided modern perception that births to women in middle life were a late 20th century phenomenon. Remarriage, of both widows and widowers, is a recurring theme running through the three generations of Petts described here. Often this occurred very quickly after the bereavement, despite in some cases the obvious greif of the surviving spouse. Phineas himself was married and widowered three times, and at least one, probably two of his wives had married before. His father and mother both married twice and so did the wicked Reverend Nunn. These remarriages took several forms. Second wives could, like Phineas’ mother, Elizabeth, be young women embarking on their first marriage, older women past childbearing, like Susan or even still fertile younger widows like Mildred. The tensions caused by these remarriages and the mixed families created had huge impact on the lives of Phineas and those around him- his lack of professional preferment from his elder half-brothers, the miserable existence Mary, Abigail and Elizabeth with Nunn and Abigail’s violent death and the disputes over their maintenance were all consequences of remarriages. We know that remarriages of this type were very common at the period and it is likely such tensions were equally common. Certainly the simple, nuclear family beloved of mythologists of the past is not much in evidence. Relative ages of couple also varied. It is likely that Phineas’ first two wives were only slightly younger than him, but Mildred was far younger than Phineas, and it it likely that Phineas’ mother was much younger than his father and his sister Rachel much younger than the dissolute Rev Newman. Of course as these women lived, they died. Some died as young children, others as young women in their prime but others (although none attained Phineas’ 77 years) lived comfortably into late middle or early old age, seeing their children into adulthood and their grandchildren born. Abigail died violently, but most died of various but often unspecified diseases. None are said to have died as a direct consequence of childbirth although Mildred was pregnant when she died. Disappointing though it is that we have got to see little of the characters of the women in Phineas’ life, only seeing the often bald facts of their births, marriages, childbearing, illness and death and Phineas’ responses to them, I think we can see a little of the sort of lives the Early Modern Englishwoman led even from this rather masculine account of a the life of a shipbuilder. At the risk of finishing on a male-centric note, looking at Phineas’ relationship with the women in his life also rehabilitates Phineas himself a little. He often comes often comes across as arrogant, grasping and spiteful in his business and personal relationships with men but in his kindness and generosity to (most of, at least) the women in his family, his affection towards them and the poignancy of the moments of tragedy he relates I see a more sypathetic man than a it would first appear. During the continuance of this work I did not neglect my wooing, having taken such a liking of the maiden that I determined resolutely (by God’s help) either to match with her or never to marry any ; the which I with much difficulty (praised be God) at length achieved, all my own kindred being much against my matching with her, by reason of some controversies grown twixt Mr. Nicolas Simonson and them. It isn’t clear what the connection is between Simonson (one of the owners of the ship Phineas was repairing) and Ann’s father, Richard (“a man of good report and honest stock”), but despite the objections of the Pett clan the couple were married in 1598. We don’t know how old Anne was when they married. Phineas was 28 and Ann would have her last child 22 years later, so probably in her late teens or early twenties. She had ten full term pregnancies and eleven children, including one pair of twins, spaced fairly evenly two years apart. Eight of them survived into adulthood. She suffered the loss of three children and one adult son. In 1613, her secondborn, the ten year old Henry died. Phineas is uncharacterisitically detached, simply reporting the death between semi-colons, sharing the sentence with the death of a carver and the return of a sailor. In 1617 (“a very fatal and troublesome year”) they lost two more, a young Phineas aged two and Mary, the eldest of the twin girls born in April of that year at just six months old. She also outlived Joseph, who died in Ireland in his late teens, but we hear nothing of Ann’s reaction to these losses. Ann appears regularly, although usually in passing, through the course of their marriage. Usually Phineas is reporting either moving house, moving his family to avoid various sicknesses, or to report on Ann’s health. We are told that she was sick during her preganancy with their first, John and when pregnant with Phineas) she had an illness which clearly greatly worried Phineas, but has a gloriously eccentric diagnosis. At the end of 1617, shortly after losing Mary and young Phineas, Ann was again very ill. The 14th February, being Wednesday and St. Valentine’s Day, my dear wife Ann departed this life in the morning, and was buried the Friday after in Chatham Church in the evening, leaving behind her a disconsolate husband and sad family. Not long after, I being at London, my only sister then living, Mary Cooper, departed this life the fifth of March, for the very grief of the loss of my dear wife. Whilst his marriage to Ann was one of love, his second marriage, to Susan Yardley was almost certainly a practical arrangement. Ann had been dead only five months when Phineas married Susan. Phineas and Ann’s first son, John, had married Katherine Yardley in 1625. John had then died at sea (a not uncommon fate for the Pett men) leaving Katherine as a pregnant widow. Susan was Katherine’s mother, i.e. he married his late son’s mother-in-law. I’m very curious how common practice this was. Was it a customary expedient, or would it have been considered odd? Susan would have been a mature woman, probably about Ann’s age- already a mother to a grown up daughter and a grandmother and there were no children from this second marriage. Ann left several children, the youngest only seven and Susan was a family friend who could raise the remainder of Ann’s children, presumably also looking after Katherine (whose son, Phineas, lived to be one of the ubiquitous Pett shipbuilders of his generation). Whilst it is easy to view Ann’s marriage as one of love and Susan’s as one of comfortable convenience, Phineas’ third and final marriage is much harder to fathom out. Again, he married very soon after his bereavement in January 1638. However the first mention of her is in July, when he describes her, almost as an aside, as his “now wife”. Even more strangely, he calls her “Bylande” in this first reference, when it is clear later on that her Christian name was Mildred and her father’s name Etherington. The autobiography’s editors suggest that she may have been another widow and Bylande may have been her previous husband’s name, but this would seem, even for the sometimes bewildering Phineas, an odd way to introduce her. Sadly, the marriage was a brief one. On September 8th his “dear wife sickened! Taken with a violent fever, being then great with child” and on the 19th “she departed this life in a most Christian manner”. I’m rather intrigued by Mildred. Who was she and how did this marriage come about? She may or may not have been another widow, but she was pregnant when she died, so clearly much younger than Phineas, who was 68 in 1638. Ann’s children would have been in less need of a stepmother by this time (the youngest, Christopher, would have been 18). Was she the young object of fancy for an aging, but by this time quite wealthy and prominent and clearly still sexually potent man? We can only speculate, but she was Phineas last wife, although he lived for another nine years. Both Ann and Phineas’ remaining daughters survived to adulthood and both may have married men related to their father’s trade. Ann, their eldest daughter may have been the Mrs. Ackworth, who Pepys describes in 1661 as a “very proper, lovely woman” married to the “knave” William Ackworth, but there is some confusion about this. The surviving twin, Martha, married Master Carpenter and Phineas’ erstwhile apprentice John Hodierene (or Odierene) when she was twenty. We don’t know of their eventual fate. In Part Three, after a quick survey of other women who make fleeting appearances in Phineas’ life along with some final thoughts. One quick erratum from my previous post. It seems that Phineas was preceded by twin sisters Jane and Suzannah, who both died, presumably as infants in 1567. I’ve edited the post to reflect this. It occurred to me whilst discussing the Dumbartons’ elsewhere that not a single woman’s name came down to us in all the broadsheets, pamphlets, letters and government records I came across. True a military rebellion is a particularly masculine affair, but were there camp followers, wives, victims of their East Anglian crimes or trial witnesses? If so their names are lost. This is less true in the life of Phineas Pett. 16th and 17th century shipbuilding was also a predominantly male activity, but as we have the tale of Phineas’ long life as a source, we encounter many women and girls. These are mostly close family, Phineas had three wives, five full and one half sister, three daughters and, of course, a mother and there are occasional mentions of others, neighbours, servants and in-laws. Notably there are no mistresses mentioned, whether this is because Phineas was more sexually continent or more discreet than his son’s contemporary Pepys is unclear. Unfortunately, with a few exceptions, all Phineas (and his early 20th century editors) tell us is the bald facts of births, marriage, sickness, and death. I realise that looking at these women in this way means that they we are still following an essentially masculine narrative with the women only having a role as they relate to Phineas. In my defence, this is a source driven piece and it is hard criticise an autobiographer for writing mainly about himself. Further we don’t get much of a sense of any of the women as individuals, more as occupiers of roles as wife, mother or daughter and. Where we see a little more of these women’s life it seems almost invariably in a tale of tragedy. Looking at them collectively though we do get some ghost of how women, from moderately poor to moderately wealthy households in the late 16th to early 17th Century lived and died and how their families were formed, grew and changed. Five children of this first wife- four boys and a girl survived into adulthood but for this generation of the Petts it is unclear if there were more births who didn’t survive or died in childhood. We don’t know when, or at how old she died, but Phineas’ mother had a child die in 1567 so Peter must have remarried no later than about 1566. Phineas was the third of nine children of his mother that we know of, five of them girls. The eldest were twin girls, Jane and Susannah, who died in 1567, three years before Phineas’ birth, presumably as infants. An unborn child is mentioned in Peter’s will, but probably did not survive. It is not clear how new this will was at the time of Peter’s death, but if this child was unborn at his death in 1589 this would put up to 23 years between Elizabeth’s first recorded and last pregnancies. Now Phineas is not necessarily the most reliable of witnesses when it comes to people who had crossed him, especially over money, but here his claim that Nunn stole the legacies of he and his minor siblings seems likely to be true. As we shall see, Nunn had other, greater, character flaws than avarice. Elizabeth’s no doubt unhappy second marriage lasted until 1589 when Phineas reports the death of his “dear and loving mother”. The next generation of Pett women, Phineas’s sisters produce some of most vivid, but saddest, glimpses of the lives of women the the very end of the 16th Century. a man of dissolute life, with whom she not long enjoyed, for god, of his great mercy, took her and delivered her from a most miserable and slavish life wherein she lived with him; by whom she had two children, but both died. How much misery can be expressed in so few words? She died in about 1591, when Phineas was 21. There were two children between in between her and Phineas so she was probably no older than 19 when she died. After their mother’s death, Elizabeth, Abigail and Mary continued to live with Nunn, who had married again. ceeded further, even to blood, for upon a slight occasion about making clean his cloak, being wet and dirty with riding a journey the day before, he furiously fell upon my eldest sister Abigail, beating her so cruelly with a pair of tongs and a great firebrand that she died within three days upon that beating and was privately by his means buried ; but God that would not let murder pass unrevenged, stirred up the hearts of his own parishioners and neighbours, who, complaining to the Justice, caused the body to be taken up, and so by the coroner’s inquest that passed upon her and miraculous tokens of the dead corpse, as fresh bleeding, sensible opening of one of her eyes, and other things, he was found guilty of her death and so committed and bound over to answer the matter at next General Assizes to be held at Bury, which was in the Lent after, being in this year 1599, and in the time of my employment in Suffolk and Norfolk. The two remaining sisters were made wards of the town of Weston until Phineas, now 29 and took them into his care. Despite clerical pressure, Nunn was convicted of manslaughter and imprisoned to “sue for the Queen’s” pardon. He was soon released but, to Phineas obvious satisfaction, soon died. Phineas was now married and working as a shipwright, but not the wealthy man he would become later. He makes much of the costs he incurred in the trial and subsequent care of Elizabeth and Mary- he was never slow to tell us of his virtues, but it seems likely that he was genuinely kind to them. No help was forthcoming from the elder brothers who Phineas says felt they had lesser responsibility to their half-siblings. This perhaps says something about the internal politics of the late sixteenth century family with its frequent remarriages and complex families of and step-parents and half- and step-siblings. Phineas however, to his credit, did not seem to reciprocate. Skipping forward a few years to 1610, Lydia, a half sister by Peter’s first wife died. Phineas had been “glad to maintain her for a long time before” died, along with her husband(“a poor man”)and they were buried at Phineas’ expense. Elizabeth and Mary, then were initially lodged with Phineas and his wife, but then Phineas arranged for Elizabeth to be “placed with a gentlewoman of good fashion”. Sadly though she soon sickened and returned to Phineas house where she died,they feared from Plague. Five children behind the 29 year old Phineas, she was probably in her early 20s. Mary then also fell ill and they feared for her life, but she survived what was a bout of Smallpox and lived with Phineas until she was married. She alone of Elizabeth’s daughters survived until middle age, dying in 1626.